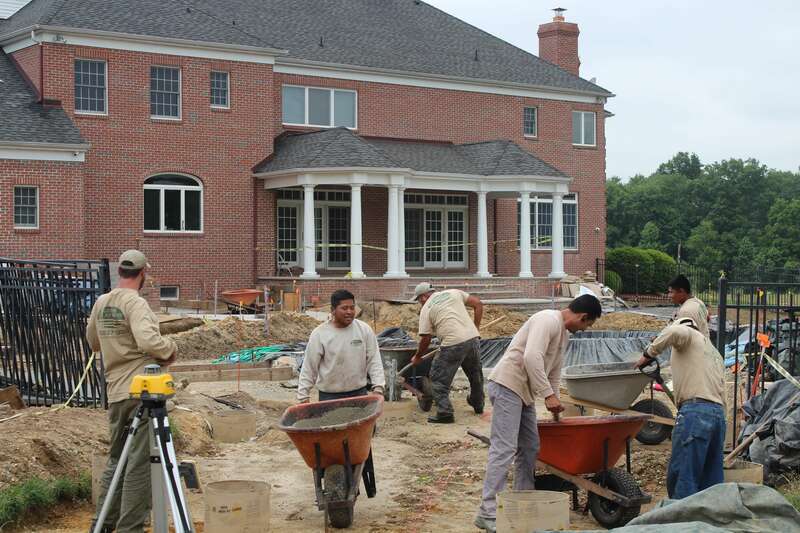 Our company has been caring for this property for over a decade! 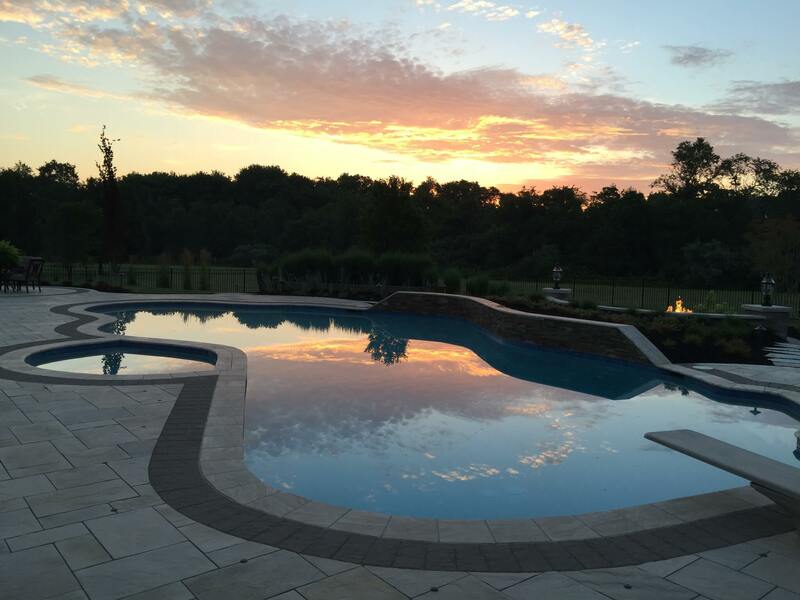 Our original client referred the new owner to us. 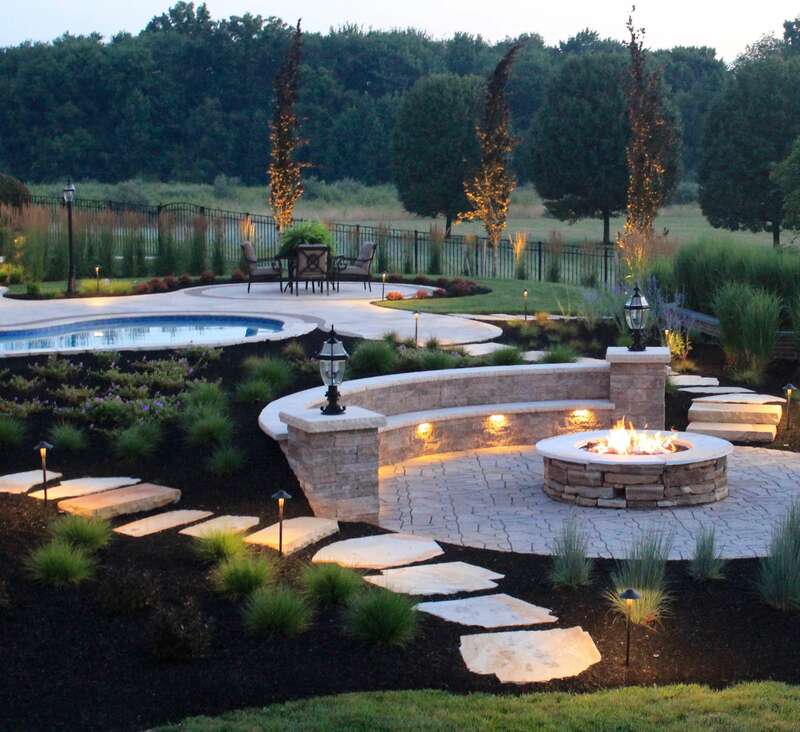 The new owner wanted to renovate the terrace, pool, and create a backyard oasis. 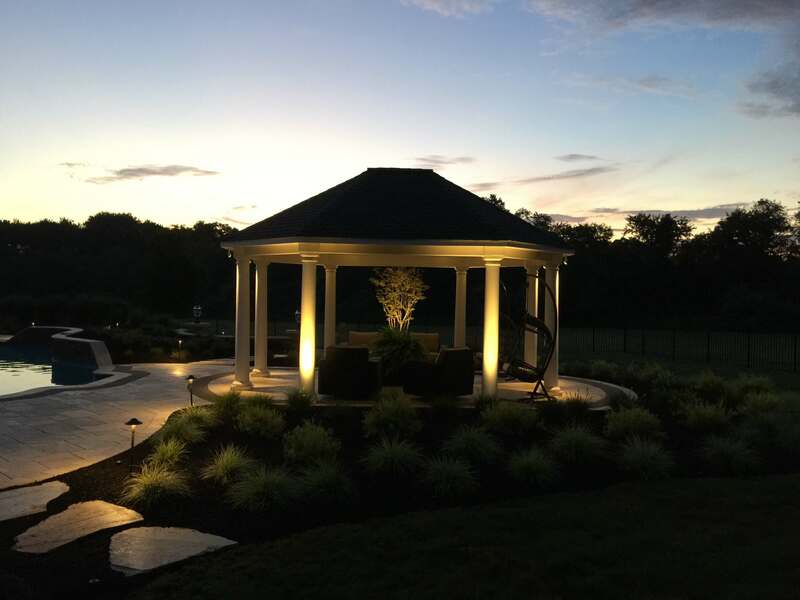 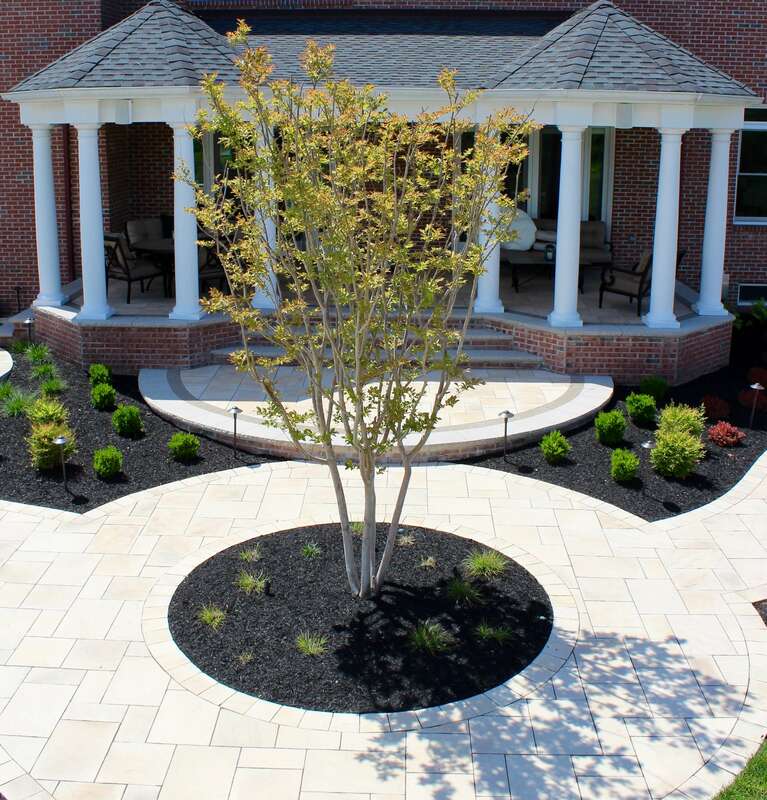 Drainage, stone selection, maintaining site lines, and concerns about bees were a few of the challenges and requests that we had to take into consideration while developing the design concept. 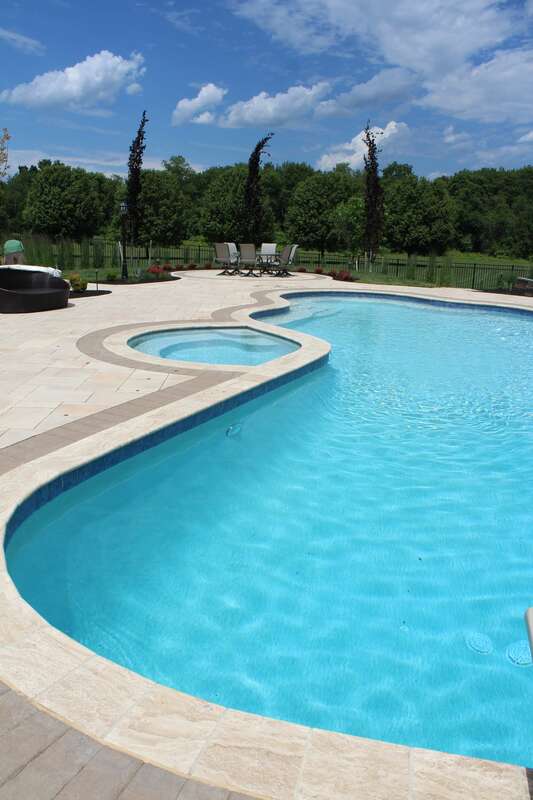 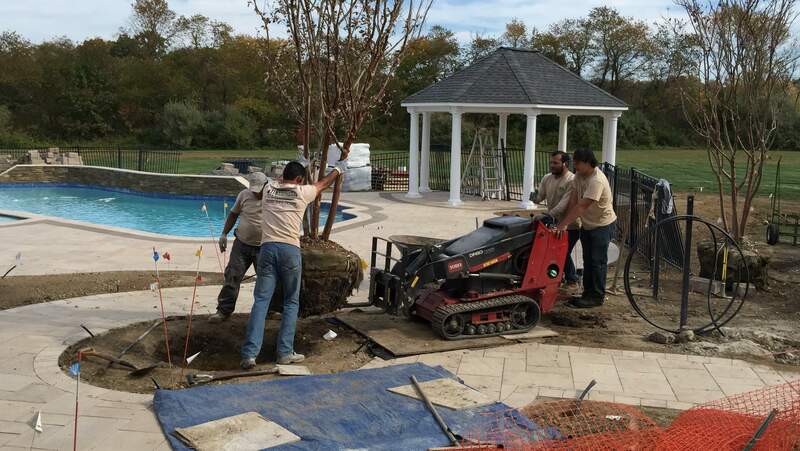 Due to the large footprint and elevation of the existing pool we had a significant amount of storm water to mitigate. 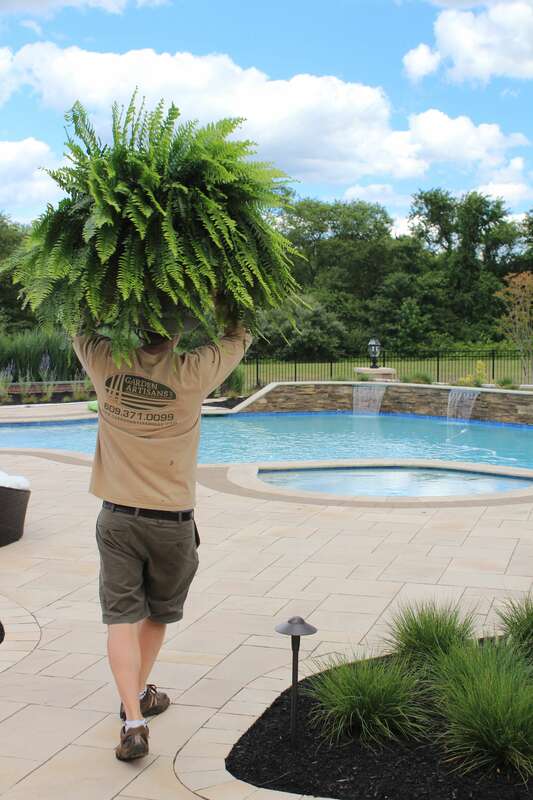 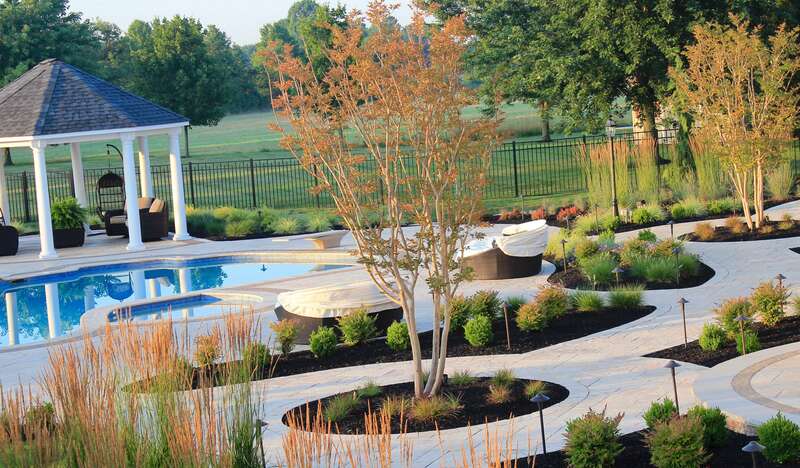 To avoid using surface drains we designed island planting beds with sub surface NDS EZ-Flow drainage to absorb surface water and move it underground away from the home, pool, and landscape. 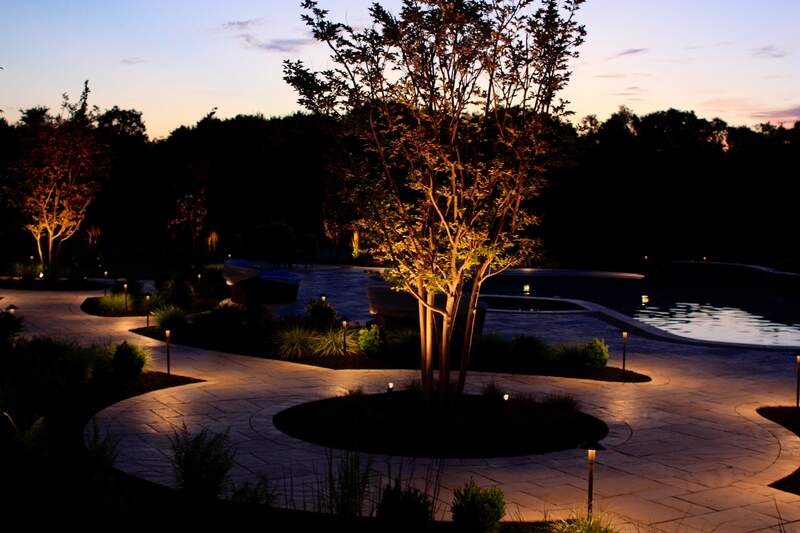 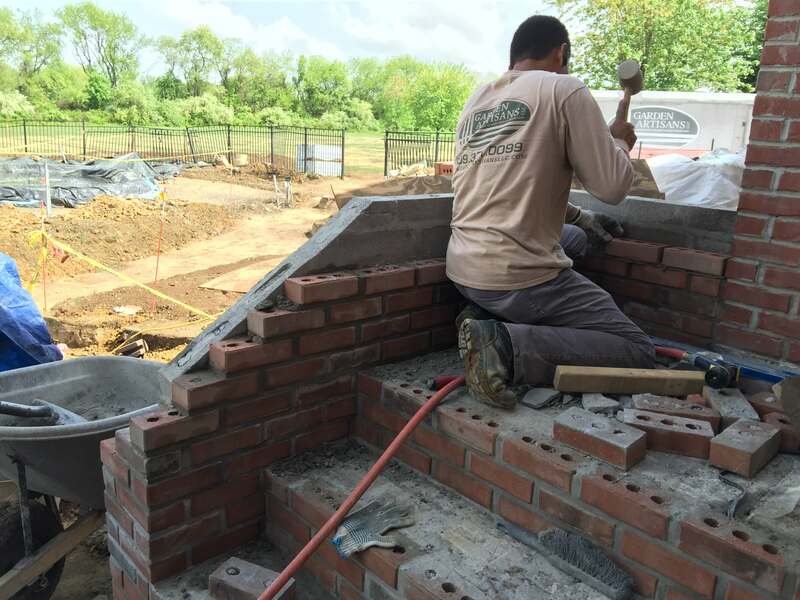 Our client considered nearly 20 different materials for his project before choosing one! 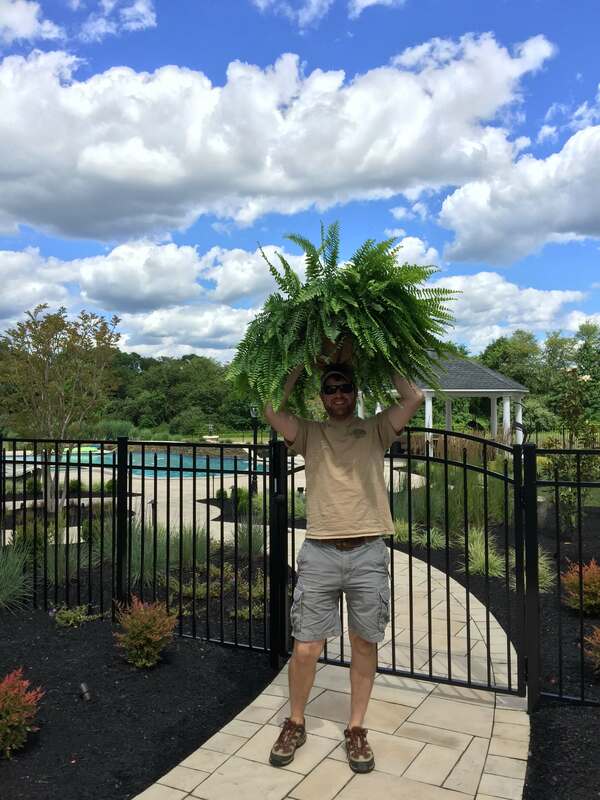 It was a process. 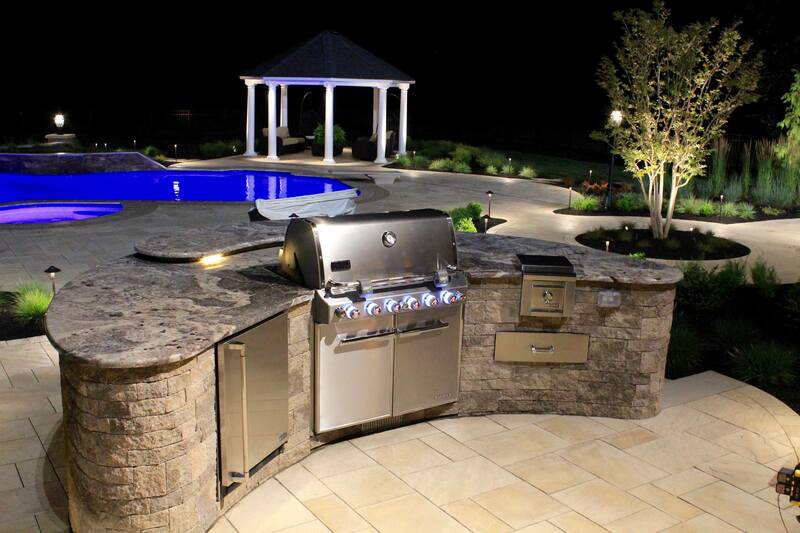 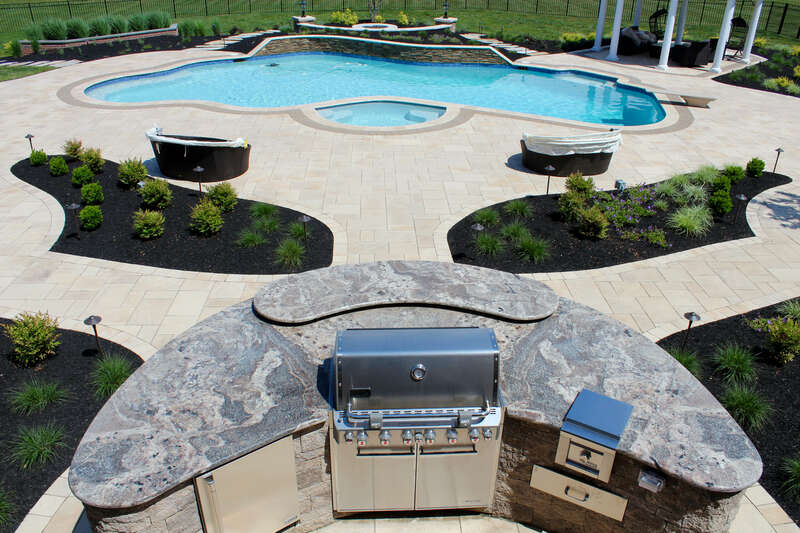 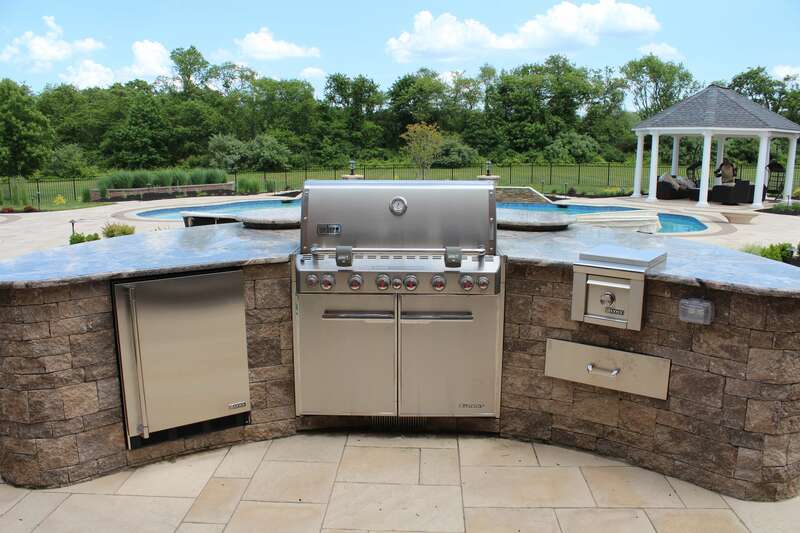 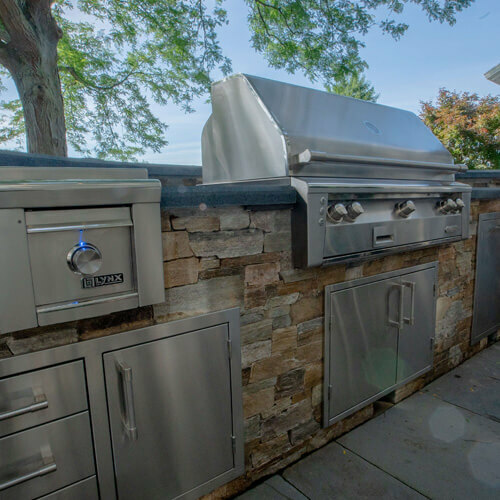 We visited and researched stone manufacturers, brick makers, and quarries in New Jersey, Pennsylvania, and Canada to find the perfect match. 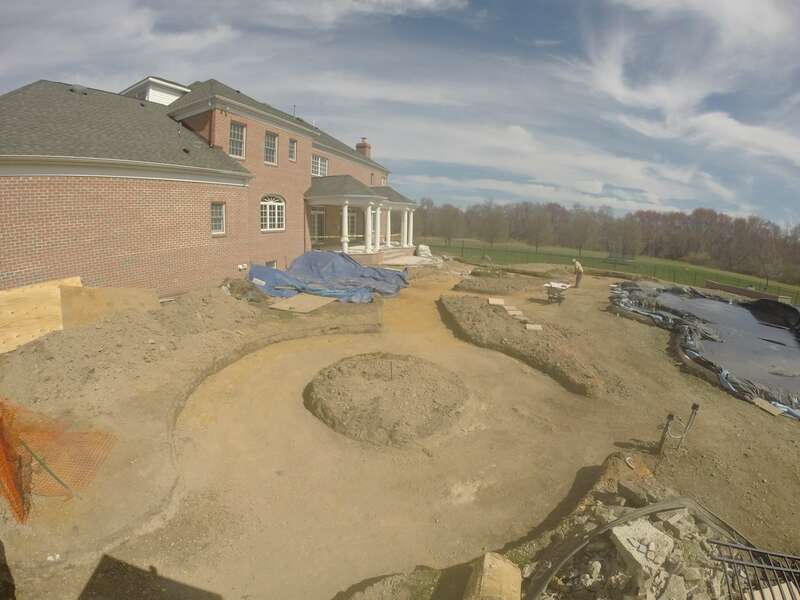 The north side of the property looks onto a 5-acre meadow and the south side looks out over a farm field. 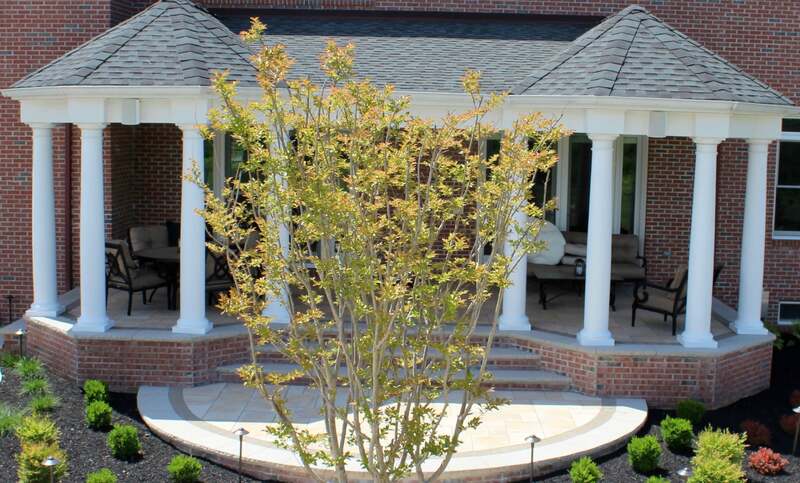 We had to be conscious of plant and branch height to preserve the panoramic views. 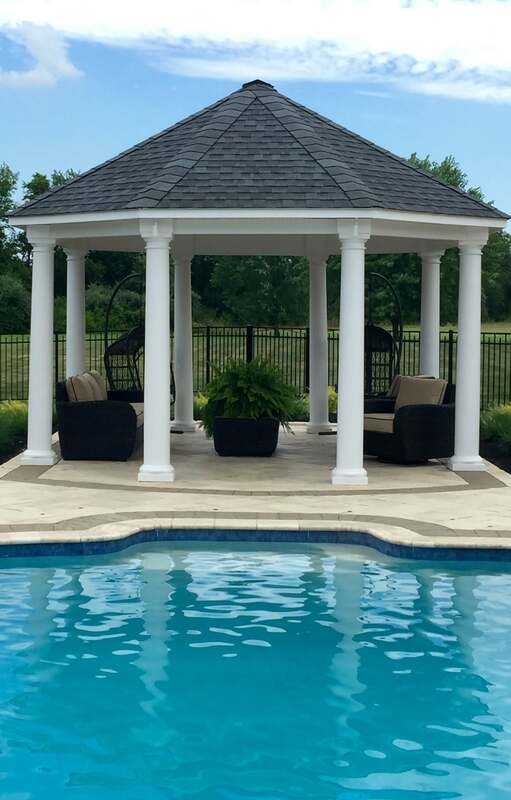 One of our client’s dogs is allergic to bees and the property is adjacent to a honey farm. 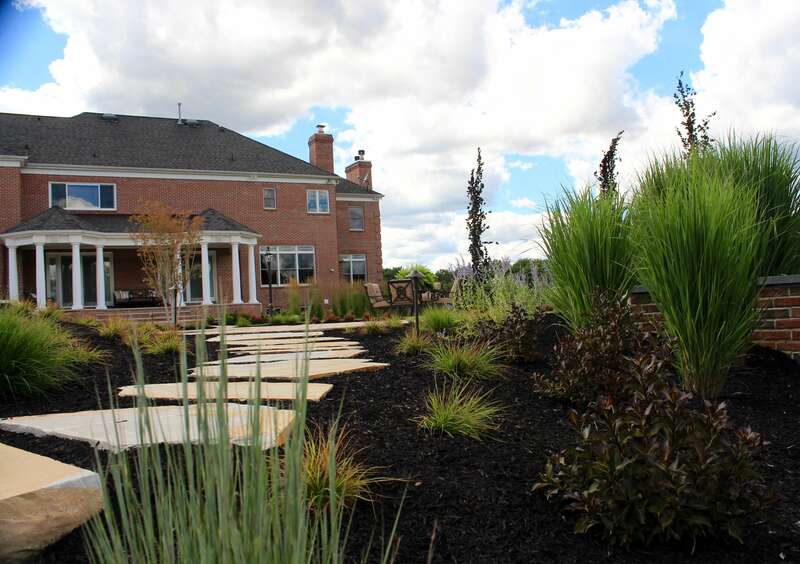 We used minimal flowering perennials for the project to reduce the risk of the dog being stung. 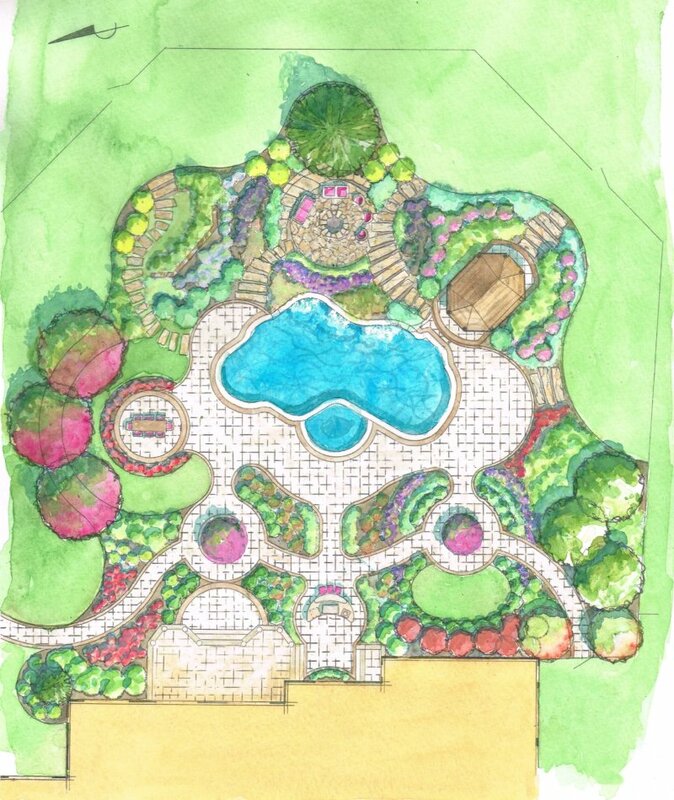 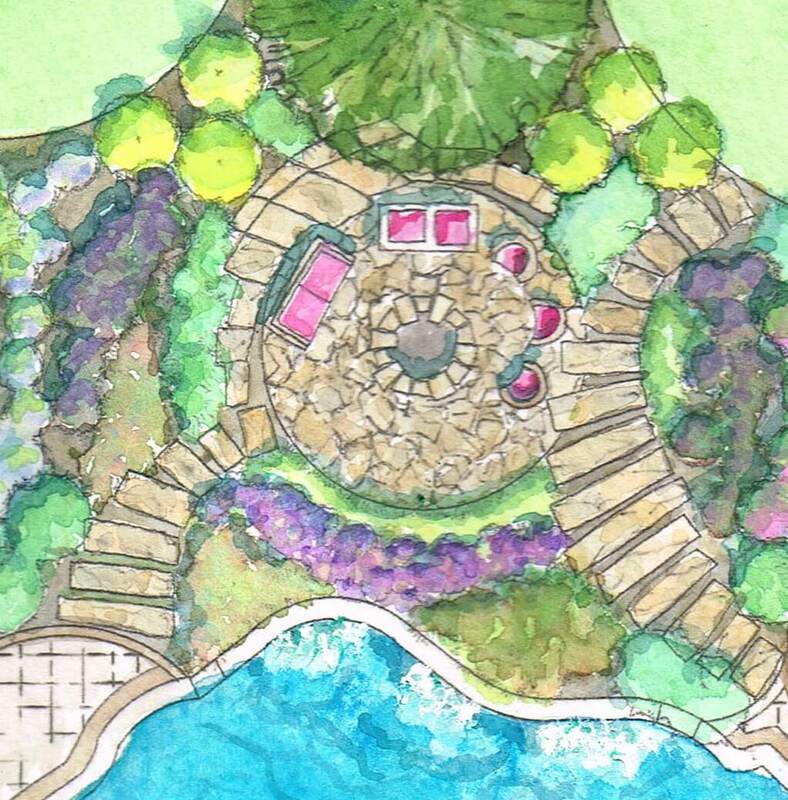 Where we felt color was necessary, we strategically encapsulated the flowering species in the center of the planting beds away from walkways, pathways, and pool deck edges. 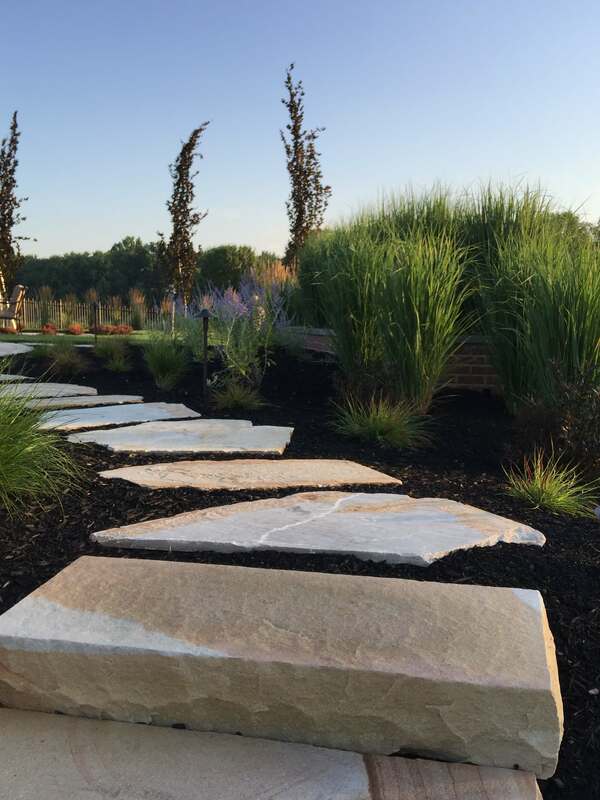 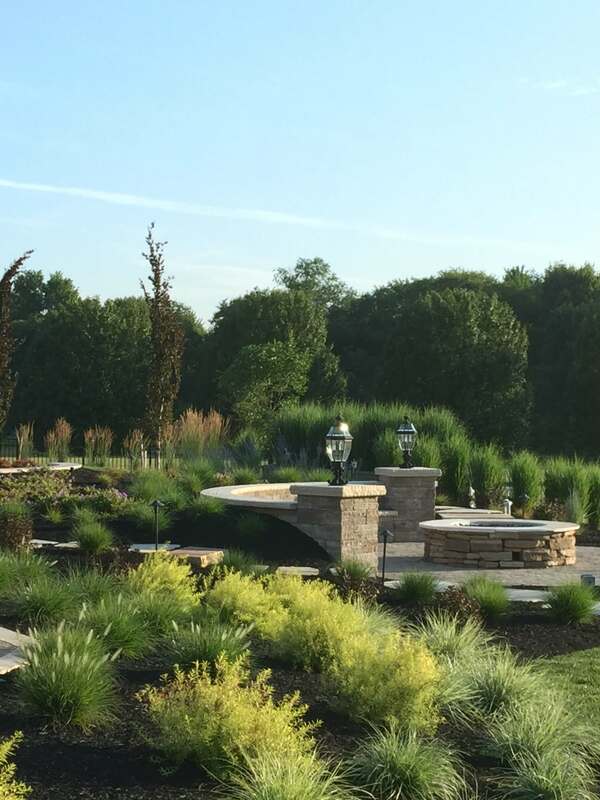 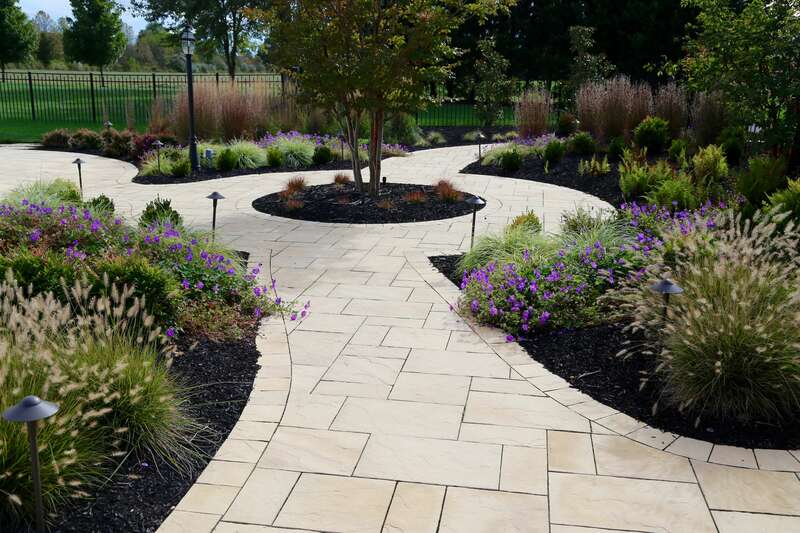 We relied heavily on perennial grasses to add color, texture, and motion to the landscape. 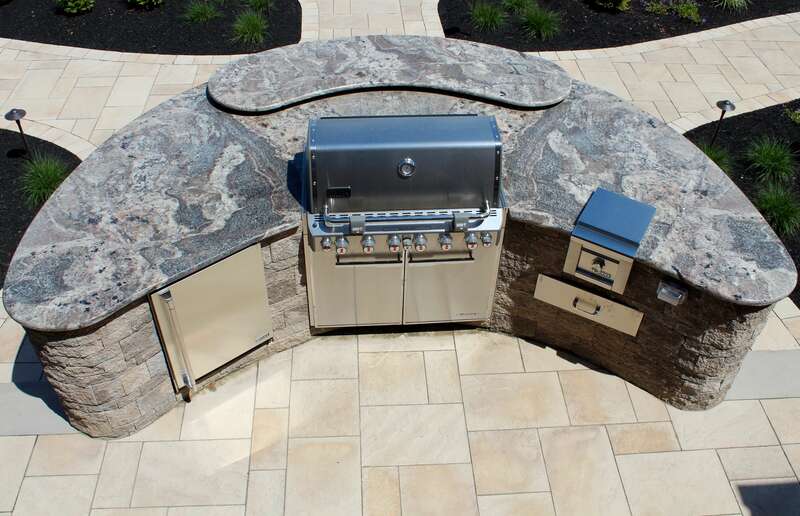 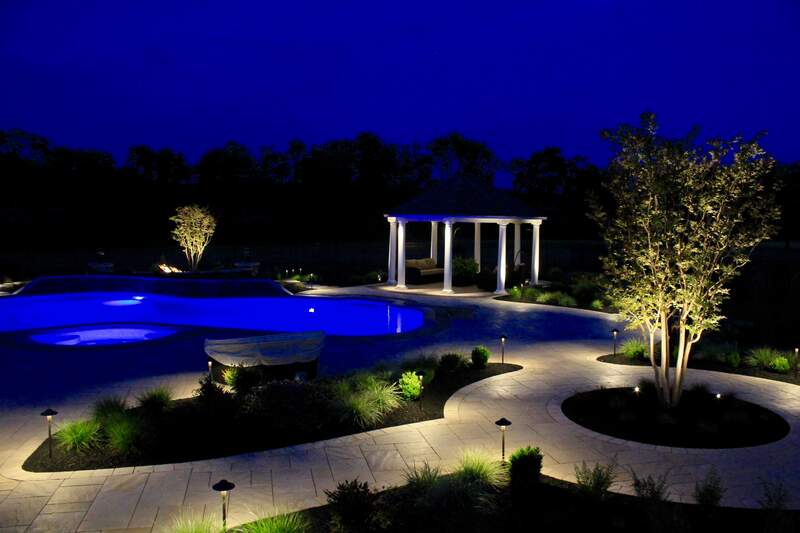 The project included an outdoor kitchen and bar with a large granite countertop, walkways, plantings, Kichler landscape lighting, NDS EZ-Flow drainage system, a new spa, waterfall wall, poolside dining, poolside pavilion, and a sunken fire pit with built-in seating. 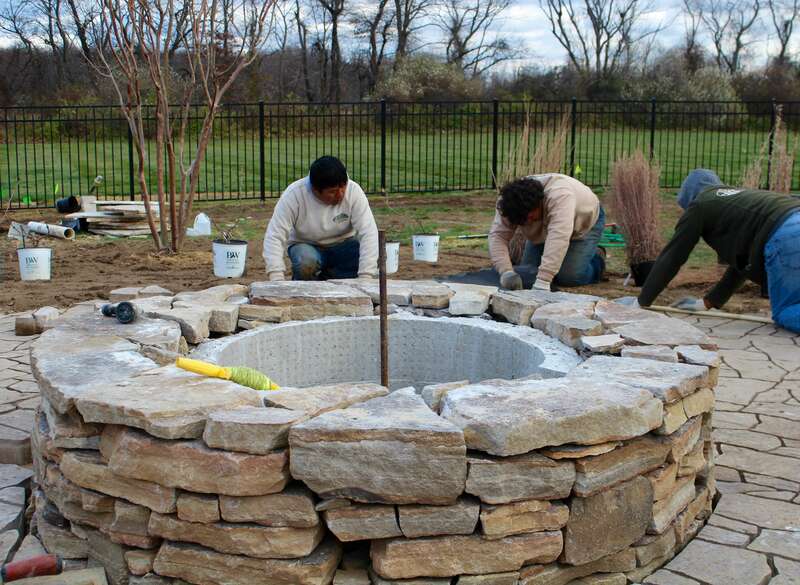 "We highly recommend working with Garden Artisans."